Texas enrollment in the federal health insurance marketplace more than doubled in the month leading up to the deadline, according to figures released Thursday by the U.S. Department of Health and Human Services. Total Texas enrollment in the federal health insurance marketplace created under the Affordable Care Act more than doubled in the month leading up to the deadline, according to figures released Thursday by the U.S. Department of Health and Human Services. Prior to March 1, 295,000 Texans had enrolled for health coverage under the federal health law, which requires most people to sign up for an insurance plan this year or face financial penalties. By April 19 — a deadline the federal government extended in part to account for technological troubles — that number had grown to 733,757, the highest enrollment jump in the nation. Though the enrollment numbers reveal extensive growth, they don't make an enormous dent in Texas’ sky-high rate of the uninsured. In 2012, more than 6 million Texans — roughly a quarter of the population — lacked health insurance, according to U.S. census data. Opponents of the law have criticized the Obama administration for its decision to extend the enrollment deadline from March 31 to April 19, which they said was another example of how flawed the process has been. Advocates for enrollment in Texas say that extension allowed individuals in the midst of enrolling to complete the process, following months of technological problems with the federal marketplace. Texas ranks third in total enrollment since the launch of healthcare.gov on Oct. 1. California had the highest enrollment with 1,405,102, and Florida had the second highest with 983,775. 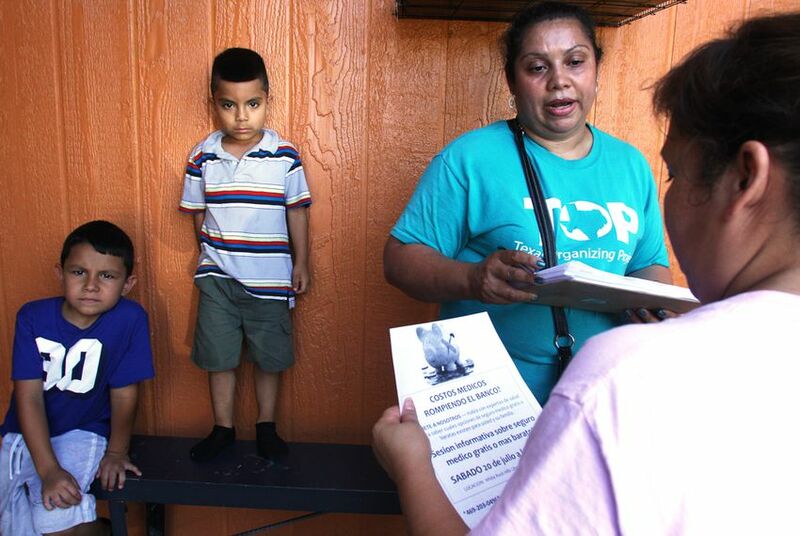 In Texas, Latinos made up 33.6 percent of those enrolled — the highest rate in the country. Women made up 55 percent of those enrolled in Texas. Individuals between 45 and 64 had the largest enrollment; they made up 44 percent of the total. Young adults between 18 and 34 made up 30 percent of those enrolled in Texas, falling short of the feds' 40 percent goal. Supporters of the federal health law celebrated this week's enrollment figures, saying they were a huge success in a state where Republican leaders have vehemently opposed Obamacare and chosen not to expand Medicaid to poor adults. But John Davidson, senior health care policy analyst for the conservative Texas Public Policy Foundation, said that while the increase was “unexpected and significant,” it is too early to know how much of an impact it will have on decreasing Texas' uninsured population. The figures provided by HHS did not include information on how many individuals who signed up through the marketplace were previously uninsured, or the number of individuals who have paid premiums on their insurance plans. In Texas, 84 percent of those who purchased health insurance through the exchange received financial assistance in the form of federal subsidies, according to HHS data. The figures also indicate that hundreds of thousands of additional Texans went through the eligibility process but did not ultimately purchase insurance plans in the marketplace.